Fractures of the distal third of the tibia are common. They represent about 3-10% of all tibial fractures . Intramedullary nail fixation for most fractures is still the gold standard , but if the marrow cavity is too small or the fracture line is near the joint surface, we just only can use the plates to to treat the fractures. AO/ASIF type 42-A1 and A2 fracture of the distal tibia is a simple fracture. According to the AO principles of fracture management, simple fracture needs anatomical reduction, strong fixation, absolute stability, and primary healing. The traditional technique of open anatomic reduction and internal fixation of distal tibial fractures requires extensive soft-tissue dissection and often leads to subsequent periosteal injury. High rates of complications, including postoperative infection, delayed union, and non-union, have been reported [3, 4]. Using a limited incision, minimally invasive technology can be a very good solution to these problems [2, 5], reducing both iatrogenic soft tissue injury and damage to the blood supply. In recent years, locking plates techniques have gained popularity among orthopedic surgeons which can preserve the periosteal blood supply and increase stability [7-11]. Kim found that in the setting of elderly ankle fractures, locking plates are at least equivalent biomechanically to standard plates, but Minihane got different conclusions that the posterolateral antiglide plate demonstrated improved biomechanical stability as compared to the lateral locking plate in osteoporotic bone [12, 13]. And Edward also found that the one-third tubular construct was equivalent to locking plate constructs with respect to union, post-operative range of motion, and rates of complications, but the locking plate was much more expensive . Up to now, sufficient evidence to favor one plate over the other in the treatment of distal tibial simple fractures is also lacking in the current literature. In the present study, we evaluated whether there were clinical, radiologic, and hospitalization fee between the use of locking and non-locking neutralization plates for treating AO type 42-A1, A2 fractures of the distal tibia with the limited incision minimally invasive technology. We performed a retrospective review of 70 patients with distal tibia AO type 42-A1, A2 fractures from January 2011 to June 2013. The mechanisms of injury were sprains, high falling injuries, and traffic accidents. Patients were included in this study if they were age 18 or older that underwent surgical management with non-locking plates or locking plates as neutralization plates with limited excision and MIPPO technique. The exclusion criteria of this study were open fractures, polytrauma, pathologic fractures, patients younger than 18 years. The study was approved by the ethics review committee of the our hospital and written informed consent was obtained from all patients. Finally, a total of 51 patients were included in this study. Patients were subsequently divided into two groups according to the type of osteosynthesis used. The locking plates group (n = 28), a titanium locking compression distal tibial plate (LCP, Trauson, China) was used. The non-locking plates group (n = 23) comprsed patients in which a dynamic compression distal tibial plate (DCP, Trauson, China) was used. The two groups were similar with respect to age, gender distribution, fracture patterns according to the AO classification system and the preoperative waiting time. Twenty-nine patients underwent surgical treatment within 6-8 hours after injury; others with soft tissue swelling or merging diseases underwent selective operation (Table 1). The surgeries were performed by two senior attending doctors. Under general or spinal anesthesia, the patient was positioned supine on a radiolucent table. With a thigh tourniquet inflated after exsanguination, routine preparation and draping of the injured limb was performed. A 3-5 cm incision was made over the fracture, then the hematoma and soft tissue in the fracture site were cleaned without periosteal stripping. The fracture was reduced under direct vision, then bone forceps or Kirschner wire were used to reduce and hold the fracture temporarily. One or two cortical screws were used as lag screws to compress the fracture site. Proper length anatomical locking or non-locking plates were selected according to the fracture line. According to the plate location, two 2-4 cm longitudinal incisions were made in the skin beneath the two ends of the plate. One incision was at the midline of the medial malleolus, the other was made along the medial aspect of the tibia located at the proximal end of the plate. An extraperiosteal, subcutaneous tunnel could then be fashioned between these two incisions using blunt dissection. The great saphenous veins were protected and the plate was inserted percutaneously from the distal to proximal direction. Four screws were inserted distally and three or four screws were inserted proximally. If the patient also had a fibular fracture to be fixed, the posterolateral approach was selected to fix the fibular fracture first. Physical rehabilitation with active motion of the ankle joints was initiated on the second postoperative day. Partial weight bearing was recommended 8-12 weeks after surgery; full weight bearing was recommended 3-4 months after surgery according to the union of the fracture. Clinical evidence of infection was recorded. Deep infections were defined as those below the deep investing muscular fascia. Superficial infections were clinically confined to the dermal and subcutaneous tissues. Follow-up assessments were included clinical and radiographic examinations once a month until the fracture had unified. Solid union was defined as the visualization of cross trabeculations on the AP and lateral radiographs. Clinical outcomes were assessed using the American Orthopaedic Foot and Ankle Society (AOFAS) ankle-hind foot instrument one year after surgery. The hospitalization fee were identified including labour costs, radiographs, surgery fee, anesthesia fee, implants cost, pharmacy supplies and hospital resoures. We also noted patients who had the plate removed because of local pain and/or skin irritation related to plates and screws. Data analyses were performed using SPSS 18.0. To determine the significance of intergroup differences, the T test and Fisher’s exact test were used. Statistical significance was defined as p < 0.05 and all statistical analyses were reviewed by an independent statistician. The mean follow-up time was 18.8 months (range, 12-23months). In the locking plate group, the surgical time was 62.44 ± 18.81 min, surgical bleeding was 77.60 ± 24.62 ml, bone union time was 13.71 ± 2.01 weeks, and the mean AOFAS score was 88± 2.01. In the non-locking plate group, the surgical time was 68.97 ± 21.31 min, surgical bleeding was 87.07 ± 30.63 ml, bone union time was 14.26 ± 2.02 weeks, and the mean AOFAS score was 86± 1.73. All fractures were primary healing. There was no significant difference between the groups in surgical time, bleeding, bone union time, or AOFAS scores. The total hospitalization fee except implants cost but including labour costs, radiographs, surgery fee, anesthesia fee, pharmacy supplies and hospital resouresin the locking plate groups was ¥12,135 ± 1,035.65 per case, and ¥12,030 ± 987.55 in the non-locking plate groups, P > 0.05.The locking plate implants cost was ¥24,648.41 ± 6,812.95 while the non-locking plate implant cost was ¥11,642 ± 3,162.57, p < 0.001. One patient in each group experienced superficial infection; these wounds were healed with the use of oral antibiotics and regular dressing changes. To date, Implant removal was necessary in 14 cases (50%) and 18 (78%) cases in the locking plate group and non-locking plate group because of local pain and/or skin irritation related to plates and screws. The need of implant removal was significantly higher in the non-locking plate group than in the locking plate group (X2 = 4.31, p < 0.05) . The cost of the removal of the plate is similar in each patients no matter he treated by locking plate or non-locking plate (P > 0.05) (Table 2 and Fig. 1). Fig. (1). The X-ray images of typical plating cases. (A) a 47-year-old female with Type A1 left distal tibia fracture and proximal fibula fracture due to a traffic accident. a: The prooperative radiographs is shown; b: The fracture was treated with a locking plate (LCP). The fracture healed 4 moths after the operation. (B) a 44-year-old female with Type A1 right distal tibial fracture and fibula fracture due to a traffic accident. a: the preoperative radiographs is show; b: The fractures were treated with two non-locking plates (DCP) for the tibial and fibula. The fractures healed 3 months after the operation. The AO/ASIF type 42-A1 and A2 fracture of the distal tibia is a simple fracture. According to the AO principles of fracture management, simple fractures need anatomical reduction, strong fixation, absolute stability, and primary healing. A bridge-plating technique in simple fractures to achieve relative stability may prolong the union time and as well as the time to full weightbearing; it may also cause other negative outcomes . The fractures in our study were reduced and fixed with lag screws. Neutralization plates were placed across the fracture to augment fracture fixation. Plate fixation helps to limit bend, rotation, and axial loads across the fracture site. Limited excision and internal fixation with MIPPO technique produces significantly less disruption of soft tissue and extraosseous blood supply than traditional surgical methods  and can also protect the blood supply, promote fracture healing, and reduce complications. The technique may be performed with either a locking plate or non-locking plate. A locking plate provides stability as a fixed-angle construct; fixed-angle properties obviate the need for compression and contact between plate and bone. A non-locking plate obtains fixation stability by the frictional force between plate and bone. This compression can cause disturbances in blood supply to the bone and can introduce an unfavourable condition for bone union. In theory, the locking plate has obvious clinical advantages to non-locking plate. However, Takemoto reported that both styles of plates resulted in equivalent results when they were used as a neutralization device in a cadaveric study . Sachiyuki also reported that there were no differences in bone union rate or complications when locking and non-locking plates were used for neutralization in malleolar fractures . Similarly, our study got equivalent results in fracture healing time and complications. This result contrasts with the study by Ufuk et al. . These authors reported that the time to achieve bone union was longer in their locking plate group (17.2 vs. 13.1 weeks). The difference between the two studies may be caused by different fixation techniques. We used limited excision and internal fixation with neutralization plates fixed with a lag screw, but Ufuk et al. used the percutaneous minimally invasive bridge-plated technology. This difference demonstrates once again that a bridge-plating technique in simple fracture patterns to achieve relative stability may prolong the union time. We emphasize here that simple fractures need absolute stable fixation and primary healing. In our study, surgical time and bleeding is less in the locking plate group. This may be caused by that the locking screw is a self-tapping screw. This can simplify the surgical process and reduce the bleeding when we tapped the bone. But there was no statistical difference. The question of whether the fibula also needs to be fixed is always controversial. Hazaika et al. reported that the fibula should be fixed in cases where it was deemed necessary to restore the stability and normal anatomy of the ankle joint, or where it was considered helpful to have a “template” for length. Toms et al. and Strauss et al. also advised to fix the fibula. Hasenboehler et al. and Oh et al. did not need fibular fixation to achieve satisfactory fracture reduction and alignment; postoperative failure of stability was not observed in their patients. In our clinical experience, if the distal fibula fracture involved the ankle and the mortise is abnormal, the fibula needs to be fixed to prevent traumatic arthritis and postoperative joint instability. If the fibula fracture is located in the middle, the fracture needs open reduction and fixation only to ensure tibial anatomical reduction; the upper fibula fractures does not need to be fixed. The postoperative infection rate of distal tibial fractures is 0-4.4% [6, 7, 22, 23]. Because the distal tibia is covered only by a thin layer of soft tissue, it tends to have a higher incidence of infection, especially when the stabilizing plate is placed on the medial side of the distal tibia [7, 22, 24]. The infection rate with the percutaneous minimally invasive bridge-plate technique is much lower . In our study, there were no cases of deep infection, but each group had a single patient with superficial infection; these infections were both successfully treated with oral antibiotics and dressing changes. These results are similar to other research [2, 6, 7, 22]. Because our study shows that the infection rate is similar with the outcomes of the percutaneous minimally invasive bridge-plate technique, this suggests that the additional incision above the fracture does not increase the risk of postoperative infection. The need of implant removal was significantly higher in the non-locking plate group than in the locking plate group. The hospitalization fee to remove the plates were similar in the locking plate group and non-locking plate group. So the cost is not the influence factor to the patients whether to remove the plates. The only reason to the patients to remove the plates is the local pain and/or skin irritation related to plates and screws The reason we think maybe that the locking plate construction is actually thinner than the non-locking plate (2.4 mm vs. 4.0 mm), And the soft tissue and skin is thinner on the medial side, it is more likely to feel plate stimulation or other discomfort, especially in the lean bodies. The locking plate also has its shortcomings. It was not exactly fit to the bony contour, especially in the region of the medial malleolus; the patients often felt discomfort and the gap between plate and bone may facilitate hematoma and obscure the hidden danger of infection. There was no significant difference between the two groups in the AOFAS scores. Gao et al. treated distal tibial metaphyseal fractures with polyaxial locking plates in patients that had a mean AOFAS score of 87.3. Our patients had similar scores. That means that limited excision and internal fixation with MIPPO technique for the treatment of extra-articular distal tibial fractures with either locking or non-locking plates can get excellent clinical results. There were several limitations in our study. First, the cases were retrospective review and not randomly selected. Second, the number of patients (sample size) was relatively small. Third, the implant choice may be influenced a particular surgeon’s own biases as it is not clear exactly why the decision was made to use a specific plant in each case. Limited excision and internal fixation with locking or non-locking plates provides a similar outcome in the treatment of distal tibial fractures of AO type A1, A2. Anatomical reduction and lag screws are recommended for stable fixation and early healing. The locking plate is much more expensive, but the locking plate seems only superior with respect to the need for implat removal that could justify its higher cost. We thank Professor Cong-feng Luo help to complete this manuscript. Ovadia DN, Beals RK. Fractures of the tibial plafond. J Bone Joint Surg Am 1986; 68(4): 543-51. Redfern DJ, Syed SU, Davies SJ. Fractures of the distal tibia: minimally invasive plate osteosynthesis. Injury 2004; 35(6): 615-20. Fisher WD, Hamblen DL. Problems and pitfalls of compression fixation of long bone fractures: a review of results and complications. Injury 1978; 10(2): 99-107. Rüedi TP, Allgöwer M. The operative treatment of intra-articular fractures of the lower end of the tibia. Clin Orthop Relat Res 1979; (138): 105-10. Zou J, Zhang W, Zhang CQ. Comparison of minimally invasive percutaneous plate osteosynthesis with open reduction and internal fixation for treatment of extra-articular distal tibia fractures. Injury 2013; 44(8): 1102-6. Hasenboehler E, Rikli D, Babst R. Locking compression plate with minimally invasive plate osteosynthesis in diaphyseal and distal tibial fracture: a retrospective study of 32 patients. Injury 2007; 38(3): 365-70. Hazarika S, Chakravarthy J, Cooper J. Minimally invasive locking plate osteosynthesis for fractures of the distal tibiaresults in 20 patients. Injury 2006; 37(9): 877-87. Wagner M. General principles for the clinical use of the LCP. Injury 2003; 34(Suppl. 2): B31-42. Anglen J, Kyle RF, Marsh JL, et al. Locking plates for extremity fractures. J Am Acad Orthop Surg 2009; 17(7): 465-72. Kääb MJ, Frenk A, Schmeling A, Schaser K, Schütz M, Haas NP. Locked internal fixator: sensitivity of screw/plate stability to the correct insertion angle of the screw. J Orthop Trauma 2004; 18(8): 483-7. Kim T, Ayturk UM, Haskell A, Miclau T, Puttlitz CM. Fixation of osteoporotic distal fibula fractures: A biomechanical comparison of locking versus conventional plates. J Foot Ankle Surg 2007; 46(1): 2-6. Minihane KP, Lee C, Ahn C, Zhang LQ, Merk BR. Comparison of lateral locking plate and antiglide plate for fixation of distal fibular fractures in osteoporotic bone: a biomechanical study. J Orthop Trauma 2006; 20(8): 562-6. DelSole EM, Egol KA, Tejwani NC. Construct choice for the treatment of displaced, comminuted olecranon fractures: are locked plates cost effective? Iowa Orthop J 2016; 36: 59-63. Borrelli J Jr, Prickett W, Song E, Becker D, Ricci W. Extraosseous blood supply of the tibia and the effects of different plating techniques: a human cadaveric study. J Orthop Trauma 2002; 16(10): 691-5. Takemoto RC, Sugi MT, Kummer F, Koval KJ, Egol KA. The effects of locked and unlocked neutralization plates on load bearing of fractures fixed with a lag screw. J Orthop Trauma 2012; 26(9): 519-22. Tsukada S, Otsuji M, Shiozaki A, et al. Locking versus non-locking neutralization plates for treatment of lateral malleolar fractures: a randomized controlled trial. Int Orthop 2013; 37(12): 2451-6. Ozkaya U, Atilla SP, Gul Murat, Sokucu Sami, Kabukcuoglu Yavuz. Minimally invasive treatment of distal fractures with locking and non-locking plates. Foot and Ankle Int 2009; 30: 1161-7. Toms AD, McMurtie A, Maffulli N. Percutaneous plating of the distal tibia. J Foot Ankle Surg 2004; 43(3): 199-203. Strauss EJ, Alfonso D, Kummer FJ, Egol KA, Tejwani NC. The effect of concurrent fibular fracture on the fixation of distal tibia fractures: a laboratory comparison of intramedullary nails with locked plates. J Orthop Trauma 2007; 21(3): 172-7. Oh CW, Kyung HS, Park IH, Kim PT, Ihn JC. 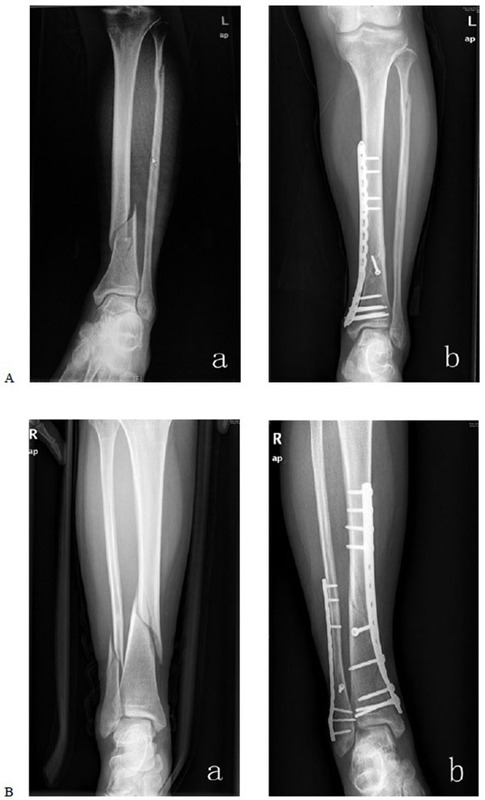 Distal tibia metaphyseal fractures treated by percutaneous plate osteosynthesis. Clin Orthop Relat Res 2003; (408): 286-91. Vallier HA, Le TT, Bedi A. Radiographic and clinical comparisons of distal tibia shaft fractures (4 to 11 cm proximal to the plafond): plating versus intramedullary nailing. J Orthop Trauma 2008; 22(5): 307-11. Krackhardt T, Dilger J, Flesch I, Höntzsch D, Eingartner C, Weise K. Fractures of the distal tibia treated with closed reduction and minimally invasive plating. Arch Orthop Trauma Surg 2005; 125(2): 87-94. Gao H, Zhang CQ, Luo CF, Zhou ZB, Zeng BF. Fractures of the distal tibia treated with polyaxial locking plating. Clin Orthop Relat Res 2009; 467(3): 831-7.